It's A Dan's World: HELP THE ALIEN QUEEN WIN! Sci-Fi Ice Sculpture Needs Your Vote! HELP THE ALIEN QUEEN WIN! 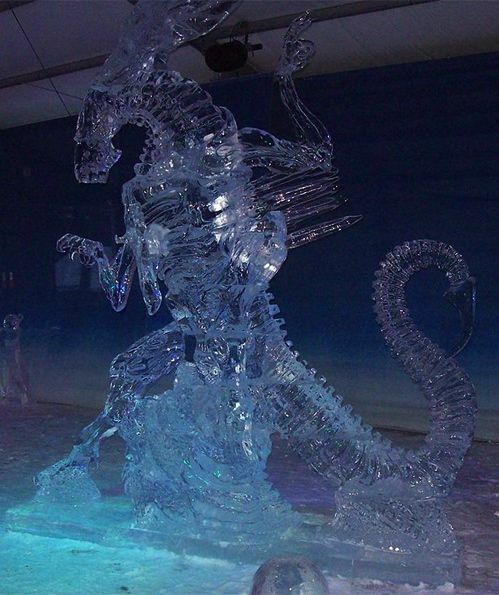 Sci-Fi Ice Sculpture Needs Your Vote! Sculpturists are like the magicians of our times (yes, and I create words). Those devious peeps can turn their hands to a tree trunk, clay or probably even my Mum's fruit cake and turn a rock solid object into something intricately detailed and dynamic. Over at Winterlude in Canada, artists Koji Kareki and Kei Sakugawa have created this astonishing glass of lemonade accessory, a giant ice sculpture of the Alien Queen. Entered in the events' ice sculpture competition, it needs your vote to win! cool, but nothing beats that Optimus Prime ice sculpture you had a while ago. welcome back mate from your walk about. And still, a flamethrower is the best thing to use again her. Thanks Dave and Random - Optimus or a flame thrower, which do you think would go best to take her down? Personally I'd still have to use one of those yellow forklift exo suits that Ripley dons - just because they look like they'd be cool to hoon around in. But so slow! I prefer movement and kabooms. It mustve took forever to make that ice sculpture.. It sure would Karl. Still you'd never be short of a few cubes to chill your coke in the meantime I guess!